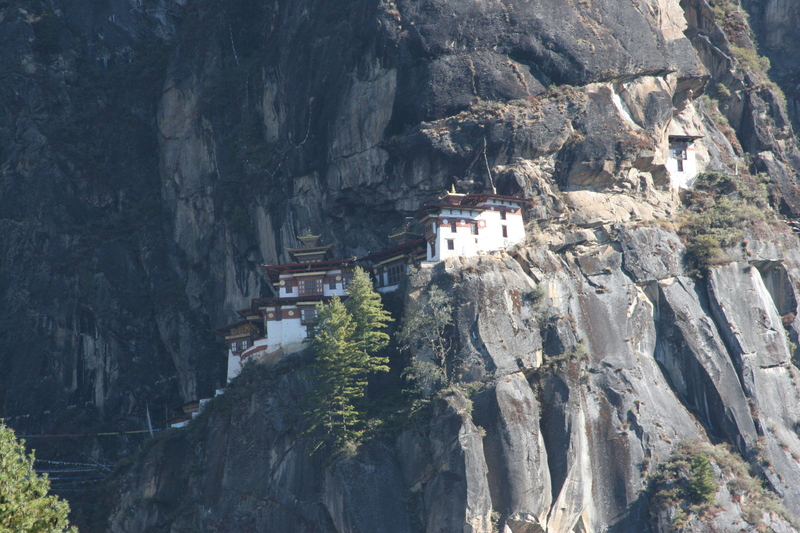 As we followed the valley, as most things do in Bhutan – planes, trucks, rivers, cows, school children, you name it – our first glimpses of Tiger’s Nest necessitated squinting. 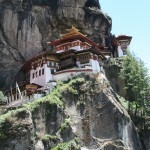 How could one of the world’s most famous monasteries be so seemingly petite? Ahh, perhaps it’s because we were roughly 2,300 feet below its 10,000 foot-high cliffside perch when the 7-templed architectural masterpiece first came into view. As we set out on foot, it became apparent that our journey there would be just as amazing as the view once we were finally successful in reaching the front gates. 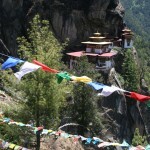 The trail to the monastery is wonderfully diverse; wooded paths to begin, tree-lined switchbacks as you ascend, gravel mountain pathways for your penultimate terrain, and as you finally reach the grounds of Tiger’s nest, stone steps, waterfalls, and a flurry of colorful prayer flags. The more you go up, the closer the beauty of the mountain hermitage becomes. Each break in the trees is one of the planet’s greatest “travel teasers” – the brief gaps in the forestation and lookout points provide glimpses of the gilded buildings and the monastery’s monks gathering on green courtyards. Along the way, we stop for, what else, tea! Served as commonly as water in the East, Bhutanese tea is always offered with biscuits, milk or sugar, and of course, a smile. The break is a welcomed rest for the feet, but mostly a treat for the eyes. The last part of the half-day hike surrounds us with whistling winds, friendly pups, and growing anticipation. 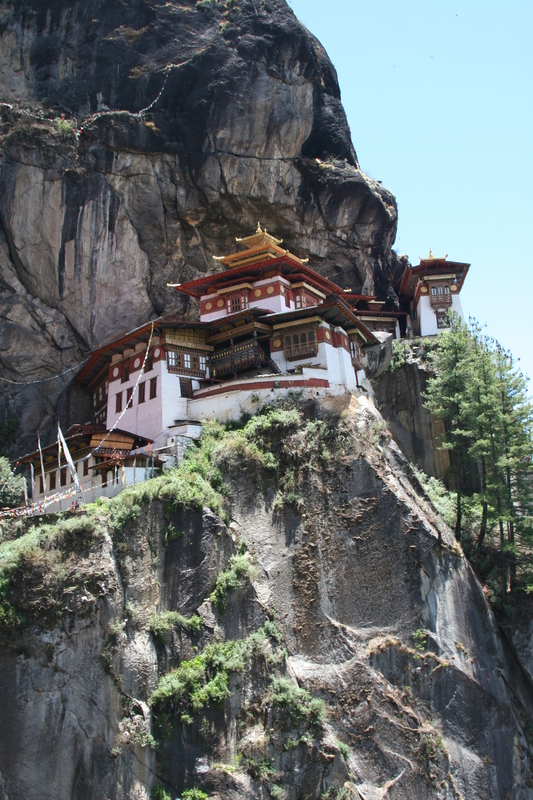 As we maneuver the bridges and stone walkways, Tiger’s nest rises up and joyfully demands attention – we have arrived – the Buddhist lair in the clouds once said to have received its most important Guru on the back of a soaring tiger. Removing our shoes, we may be invited into such rooms as the “Cave of 3-Month Meditation”, or the “Speaking Statue Room”. Each holds fascinating cultural significance, and we are introduced to the pragmatic daily life of the monastery’s keepers; the fortunate monks chosen to take care of this invaluable piece of Bhutanese history. After taking it all in, asking questions to our knowledgeable guides, and sharing greetings with the holy men, we retreat back across the ravine to a panoramic spot for a hot trail lunch provided by some of our friends at one of Paro Valley’s best yak camps. The aromatic food and the picturesque views make passing hikers quite jealous, and ourselves extremely content. As we return to our vehicle after descending and retrace the Paro Valley’s winding roads back to town, Tiger’s Nest does in fact look small again, but now we know better, and the memories we carry with us are quite large indeed. 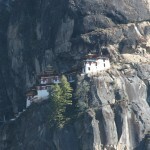 Want to experience Tiger’s Nest? 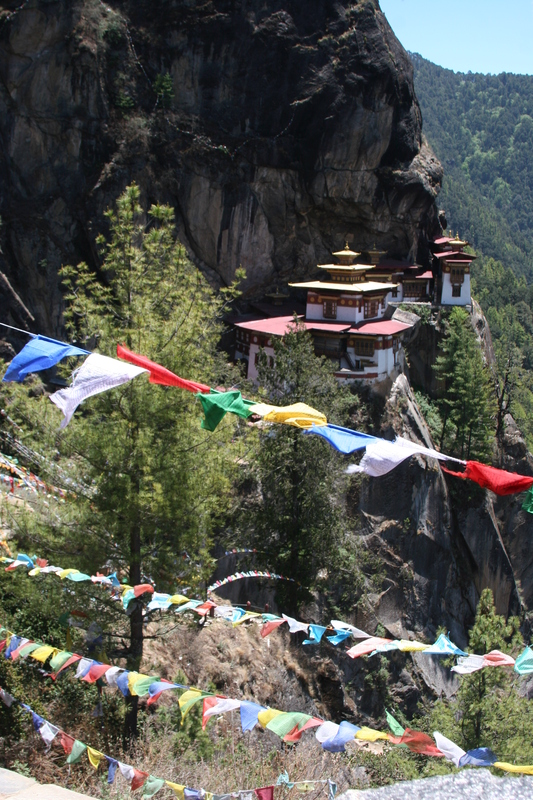 Join Boundless Journeys‘ Bhutan: A Journey Into the Peaceful Kingdomdeparture scheduledfor October 13-24, our Bhutan: Festivals of Bhutanitinerary beginning Sep 24-Oct 02, or our Bhutan: Chomolhari Trek group hitting the trail October 26-November 7.